On April 2nd, 2017, Daniel Hope & Friends featuring Edgar Meyer and the Dover Quartet gave a stirring performance of Tchaikovsky’s Serenade for Strings in C Major, Opus 48. Hear it, along with Mozart’s Divertimento for Strings in D Major, K. 136, on this episode of Savannah Music Festival LIVE. In this episode, we listen to highlights from the SMF debut of Molsky’s Mountain Drifters, an old-time trio consisting of Bruce Molsky on fiddle and vocals, Alison de Groot on clawhammer banjo, and Stash Wyslouch on guitar and vocals. In the spring of 2018, Béla Fleck & Abigail Washburn returned to the Savannah Music Festival to play this stirring set of Appalachian murder ballads, gospel, chamber, bluegrass and blues. After a day-of-show rehearsal, they also welcomed members of the Zurich Chamber Orchestra to the stage for two songs. In 2017, Lúnasa and Tim O’Brien joined forces to embark on a transatlantic musical expedition, exploring the interplay and mutual influences at the heart of American and Irish traditional music. In this episode, we listen to highlights from a concert featuring Tim O’Brien and Lúnasa at the 2018 savannah music festival. Nordic folk music includes a number of traditions from Northern Europe, especially the Scandinavian countries. In this episode, we listen to highlights from a 2016 SMF program called “When the Danes Met the Swedes” – combining the Swedish trio Väsen with the Danish String Quartet on a unique double bill. Pianist Marc-André Hamelin is known worldwide for his unrivaled blend of consummate musicianship and brilliant technique in the great works of the established repertoire. This episode features highlights from his 2018 recital at the Savannah Music Festival. The music of Flatt & Scruggs has been given new life by dobro player Jerry Douglas’ award-winning ensemble the Earls of Leicester. In this episode, we listen to the Earls’ second SMF performance, given in 2017 at the Lucas Theatre for the Arts. German Lopez is an esteemed timple player from the Canary Islands, an archipelago off the northwest coast of Africa that belongs to the nation of Spain. In this episode, we listen to German Lopez’s SMF debut in 2017 alongside his musical partner, guitarist Antonio Toledo. Richard Thompson is constantly ranked among rock n’ roll’s greatest guitarists and finest songwriters by the music press and fellow musicians. His return to the Savannah Music Festival in 2017 spotlighted his abilities as a solo performer, including material from his earliest days with Fairport Convention through his latest solo album. In this episode, we listen to part two of a two-part show from SMF 2016 with the Time Jumpers featuring Vince Gill. Flamenco guitarist Vicente Amigo made his southeastern U.S. debut at the 2016 Savannah Music Festival. This episode is part two of two. The flamenco guitarist Vicente Amigo, from Seville, Spain, has called his engagement with his instrument “beloved torture.” You can imagine why when you hear him play: he reachers for depth of expression within ultimate precision, and sometimes at breathtaking speed. In this episode, we listen to Vicente Amigo’s Savannah debut. Part one of two. It all started when Ray Benson and some of his buddies joined forces in the early 1970s and created a band with one simple goal: to play and help revive American roots music. The band that Benson founded over 40 years ago is called Asleep at the Wheel, and they are still going strong today…. Gustav Mahler was a student in Vienna when he wrote his first piano quartet at age 16, showing remarkable technical ingenuity and emotional passion. Mahler assimilated the influences of Schumann, Mendelssohn and Brahms to create a work of distinctive profile, only 15 years after Brahms created two of the greatest piano quartets in the literature…. The art of musical composition generally consists of the manipulation of harmony, melody, form, rhythm and timbre. In the case of Johannes Brahms, creating such order was often an arduous task, and it was completely common of him to destroy the original version of a work if he thought it was in any way inadequate…. Ardently exploring the origins of American music in jazz, blues, country and western swing, singer and guitarist Pokey Lafarge seems like a throwback, yet the music he plays never sounds old-fashioned. In this episode, we listen to Pokey Lafarge’s final performance of four given at the 2014 Savannah Music Festival. Q&A with SMF Supporter Wet Willie’s Management Corp. The Savannah Music Festival is pleased to announce the hire of two new staff members. Georgia Governor Nathan Deal presented the first annual Governor’s Awards for the Arts & Humanities. The Savannah Music Festival (SMF) was among two organizations and ten individuals that received the 2012 award out of nearly 100 nominations statewide. Though he lacked the sheer power of many other keyboard artists in his day, Polish-born pianist Frederic Chopin more than compensated with his impeccable virtuoso technique and inspired musicianship. He incorporated the beauties of Italian opera into his piano compositions and performances, making them notable for their clarity of articulation, singing tone and flowing legato…. The sound of the Hammond B-3 organ with a Leslie speaker evolved in mid-20th century America through a range of musical genres that included blues, rock, gospel, and most notably, jazz. Many of the finest players on the instrument were jazz musicians, and the trail they blazed on the instrument is still being traveled today…. Original air date: week of August 19, 2011 Bassist Edgar Meyer and banjoist Bela Fleck had collaborated for nearly thirty years, but in 2008 when they formed a trio with tabla master Zakir Hussain, they created a small group in which each member offered up original compositions based upon their virtuosity and shared musical ideas…. 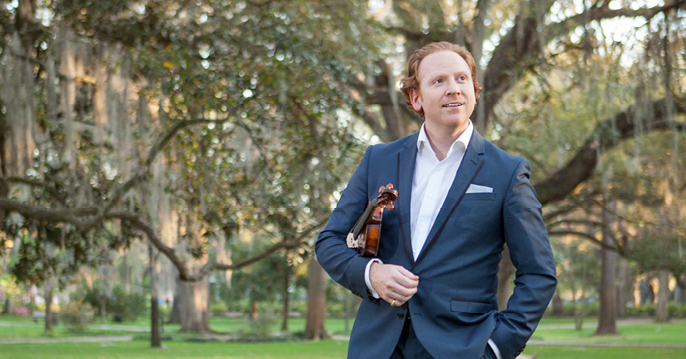 For chamber music lovers, springtime in Savannah is a veritable feast of music for 17 days. Some of the world’s finest classical musicians gather to rehearse and perform masterworks of the idiom in historic and intimate spaces. Tune in to hear performances by artists returning to the 2011 festival. Original air date: November 7, 2010 This episode is a sneak preview for GPB listeners of artists returning to Savannah in 2011. Stay tuned for our complete season announcement on November 10th! Original air date: week of August 2, 2010 While it’s hard to give a satisfactory definition of “genius,” it nearly always happens that artistic genius expresses itself in youth. With the greatest of geniuses there follows an extended period of prodigious activity at the highest level, which seldom sustains its fire throughout a long life…. Original air date: week of May 31, 2010 In December of 1891, Czech composer Antonin Dvorak accepted the offer of Jeanette Thurber to become the director of the National Academy of Music in New York City. Mrs. Thurber hoped that the conservatory, which she founded in 1885, would foster the development of American concert music….